Combine pineapple juice, orange juice and cider vinegar in a small saucepan over high heat. Bring to a boil and then reduce heat. Simmer for 25 minutes. Separate 1/2 cup of juice mixture and cool. Reserve remaining juice separately. Add lime juice and mint to the 1/2 cup of cooled juice mixture. 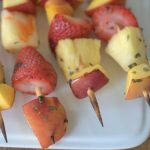 Thread fruit onto skewers. Pour cooled juice mixture with mint over fruit and turn to coat. Heat grill to medium heat. Place skewers on grill and brush with mint juice mixture while cooking. Cook for 2-3 minutes before turning. Brush with mint juice mixture and cook for another 2-3 minutes. Serve with reserved juice on the side.